I had a slick setup with my Windows Mobile 5 HTC 8125 cell phone and my iMac. Using Salling Clicker’s bluetooth proximity detection features, I could lock/unlock my computer by walking up to it with my phone. If I got a phone call, iTunes would fade out and pause while the CallerID information was displayed in a transparent overlay on my iMac’s screen. You don’t need Salling Clicker to get some cool cell phone on Mac love… by pairing a cell phone to a mac using the built in Bluetooth Device manager, you get on-screen callerID notifications, as well as the ability to dial using your address book. Really slick. With the announcement of the iPhone, I haven’t been looking forward to the iPhone itself as much as I have been looking forward to the industry’s reaction to it. Apple’s attention to user interface will be a great shot in the arm for the cellphone market. The hype around the iPhone has shown that user interface is a huge factor to the customer. The response is already happening. Today HTC brought something very exciting to the table… the HTC Touch. 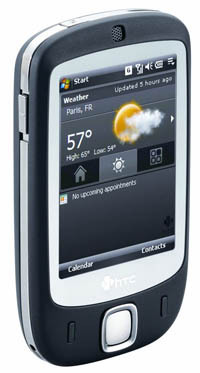 With the Touch, HTC has built a new user interface on top of Windows Mobile 6. It uses a lot of the same finger swiping controls that you see on the iPhone. I think these gesture based displays will become the norm on our devices. The Touch is on sale now in London, but doesn’t seem to have the frequency band needed to be used in the US. I hope a US version will be launched soon, for those of us on the west side of the “pond”.